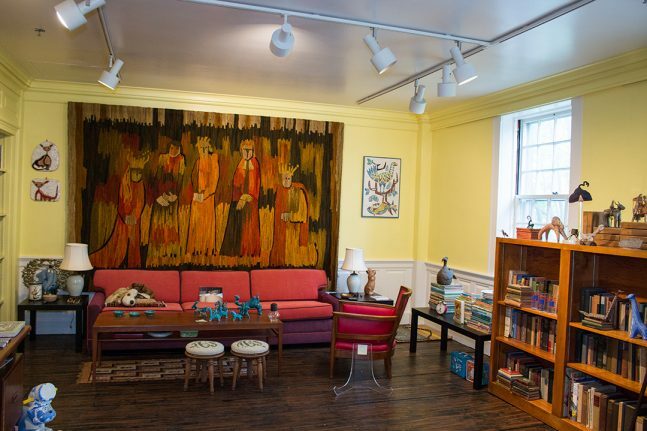 Leagrey Dimond has donated many of Ted Geisel’s furniture and possessions to recreate his La Jolla, CA, studio and sitting room (including the chair, drawing table, and art materials he actually used). This exhibit includes the Geisel Grove sign that used to hang in Forest Park while his father was Superintendent of Parks. And see if you can find Theophrastus, the toy dog Ted was given in Springfield and kept with him throughout his life. This exhibit space also features never before publicly displayed art and personal, quirky notes he used to share with his stepdaughter, who he nicknamed Snunny and Lea Groo.